Pies glorious pies. I think I might just have tasted some of the nicest vegan pies of all time. They are being sold at our local produce market in Swansea, Wales, by a company called Fruits de la Terre. We had eaten them previously when they were on sale in the nearby town of Carmarthen, so it is brilliant they are now available so close to home in Swansea. Having moved here from Bristol, where vegan food is more abundant, it is really great to see veganism being brought to Wales and particular to an indoor market which is overrun with meat and dairy. Owner Emyr Harris and his colleague Tom, make a great selection of pies, nut roasts and burgers, by hand, to sell at the market on Fridays and Saturdays. 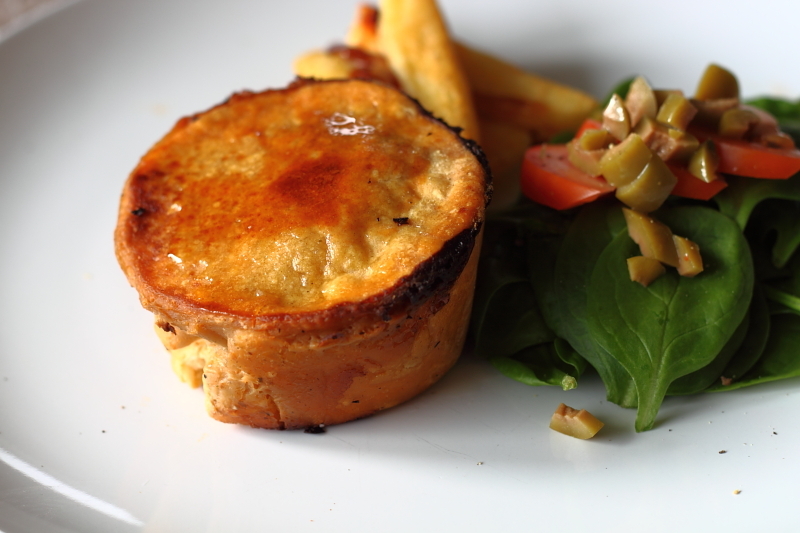 Pie varieties include Wild Mushroom and Ale, Moroccan Tagine and Red Thai Curry. We also had one of their Curried Spinach and Chickpea Burgers for lunch when we got home. It was really wholesome and packed with flavour. Fruits de la Terre also sell in other markets in Wales; Haverfordwest every Friday, Aberystwyth every 1st/3rd Saturday and Brecon every 2nd Saturday. Congratulations to them for showing the general public – especially all those market go-ers – that fabulous homemade produce doesn’t have to contain anything from an animal.